Industrial control transformers (also known as machine tool transformers) fill the size range from 25VA to 7500VA and up to 600volts. 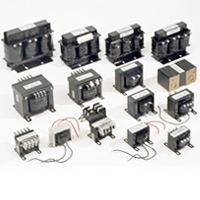 They are used to step-up or step-down the supply voltage for the operation of electromagnetic devices such as timers, relays, contactors or solenoid switches. A critical element in their proper usage is to supply correct voltage during short-term periods of inrush currents, providing isolation to control components from power surges and lighting circuits. Marcus offers a broad range of control transformer options to satisfy our customer’s requirements. If the unit will be installed inside a cabinet or panel, choose our option style (MO) with standard screw terminals or with terminal block (MTB) or the finger safe encapsulated model (MTS). All open type models are available with leads upon request. For standalone installations, we have the closed type (MC) and an epoxy encapsulated model (MEC) for harsh environments. Our Buck-Boost transformer can be connected for a wide variety of voltage combinations. Whichever model you select, you can be assured of Marcus quality. All our industrial control transformers are manufactured with bobbin-wound copper coils, incorporating high-quality insulating materials, superior grade laminations and extremely rugged solidly fixed terminals. This ensures that they operate more efficiently and are more reliable than comparable brands. Control transformers are required in circuits that require steady voltage or steady current with a low power or volt-amp rating. They are usually designed for industrial applications where electromagnetic devices such as relays and solenoids are used.